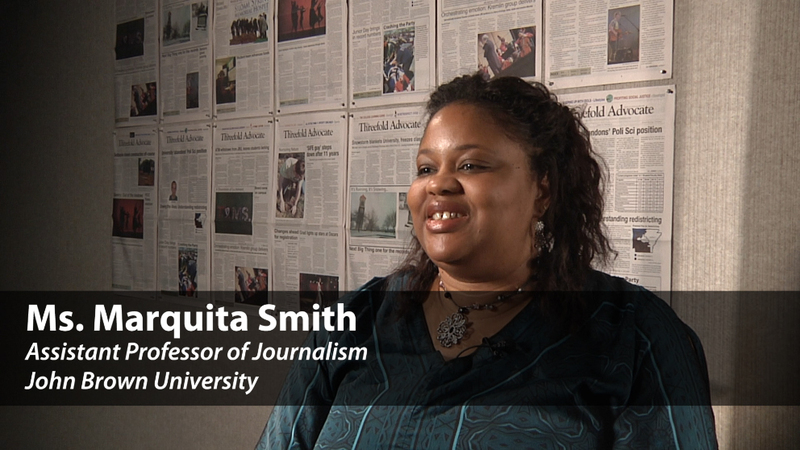 I am Marquita Smith, and I teach journalism and public relations. For fifteen years, I worked at several newspapers throughout the south. The last person I hired was a person who could come in, who could shoot video, who could write a story, who could edit video, and that was the expectation, is that we had a person who, I would call was a backpack journalist, that could roll from any place, anytime, anywhere, and get the job done. And so those are the kind of people I want to come out of this program. I want students to come through this program being able to think critically. Understanding who they are so they can see, and truly see, who people are. And to do that, it starts here first. Understanding God’s purpose, and fulfilling his plan for you. And I want every person to be able to reach their potential and live out the purpose. Getting to know them early on in that first News I class is really key. Because this is how I’m going to shape them. I treat them as if they were employees of mine, and if we were in the newsroom. I may come in with a topic of the day, and they write during the class. They file before they leave, and they have a real product. Knowing that they can turn a real piece of work in an hour builds the confidence they need to be able to do it in the workplace. That is probably one of the most exciting things about news is creating something, being able to be a part of something that’s growing. I have faith that it will be something special, and that this, you know, that it will change lives. And it’ll reach people, not only just in Northwest Arkansas but in the world.